It’s often better to be lucky than good. 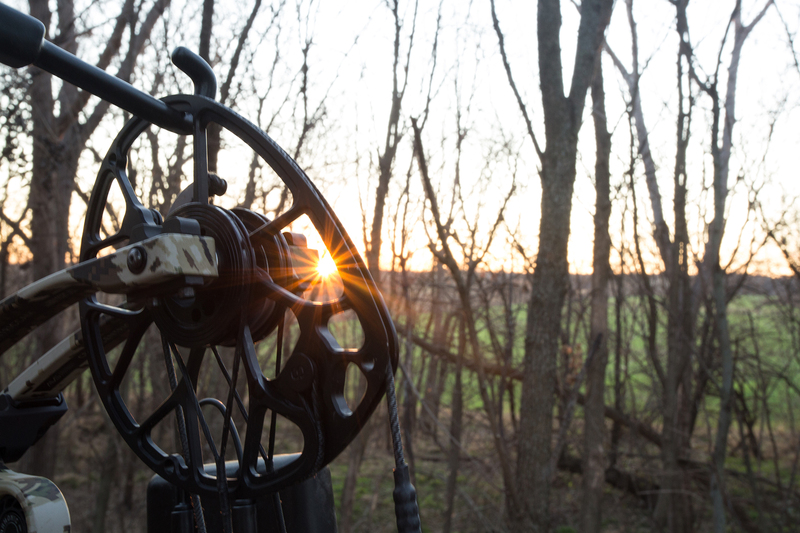 This article takes a look at how onX can help you create your own luck chasing Midwestern whitetails. Every real deer hunter I know here in Kansas believes in luck — or fate, karma, kismet, serendipity, chance, whatever you want to call it. But, unlike the average hunter, a good whitetail hunter makes their own luck. Information is power, and as hunters in the modern age, we have a few advantages the old timers didn’t. Digital scouting has changed the game, and onX is spearheading the next step in that evolution. So maybe we can all make a little more luck of our own with the technology in this app. Take a look at how I use onX to get after it. Before onX, I was obsessed with Google Earth for preseason deer scouting. I eventually figured out how to place pins and integrate state walk-in hunting areas. But land ownership and public hunting boundaries didn’t show up, and the technology was generally cumbersome for the task. 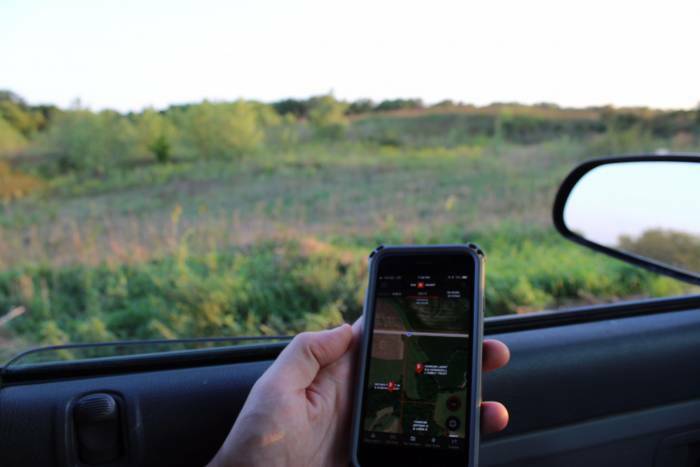 Then, two years ago, I was introduced to onX, a relatively new digital map software company designed specifically for hunters. I’ll be approaching this review of the platform from the perspective of a Midwest whitetail hunter. However, onX is just as valuable to the Western hunter navigating large blocks of public land. The first feature that really stands out with onX is the land ownership information. Unlike public land elk in Wyoming or Montana, a big part of hunting whitetails in the flatlands involves getting permission to hunt private land. Some of us are lucky enough to have access to quality public lands. 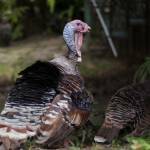 But the average deer hunter wants to find a chunk or two of private ground to hunt. To access landowner info, simply left click on the parcel you’re interested in, and the ownership information will appear. It’s up to you to do some sleuthing from there. At its most basic, onX combines satellite imagery, ownership boundaries and names, and an optional topographical map layer to help locate terrain features. These features help you weed out the “maybe” spots from the “definitely” spots. Of course, I would never tell someone to discount a spot because it didn’t look promising from a satellite. But we all need a little efficiency in our lives. Once I find a spot that looks promising with the help of onX, I want to put my eyes on it. The whole game here is narrowing down the list to those two or three locations on a given tract that fit the bill. Once you’re there, it’s time to dive in. Like most platforms, the app isn’t as user-friendly as the desktop version. But it’s easy enough to remain a useful tool for capturing information on the fly. If I see a spot and I’m lucky enough to get permission, the next step is walking as much of the place as possible in the late winter and early spring. Rubs, scrapes, trails, and beds show up a lot easier that time of year. Each one of those can be added as a waypoint using the app. After a good day of scouting an 80-acre tract in early March, I generally have a decent idea of how deer use the land and how different variables might affect those patterns. This includes a change in the food source, weather, time of year, etc. I pay special attention to rubs, bedding areas, scrapes, and noticeable trails (especially when they cross at pinch points). The onX app lets you add waypoints with labels for all of these points of interest. It’s amazing how much clearer deer travel and behavior become once all this information is in the same place. I like to leave notes under each waypoint: buck vs. doe bed, the freshness of scrapes and rubs, and any other piece of information that might help build a clearer picture of deer behavior. Once I have a good idea about general areas of interest, it’s time to get boots on the ground and go through the excruciating process of picking a tree. I’m terrible at this part. Indecision has turned plenty of one-hour jobs into two-hour jobs. But once the stand is in the tree, you mark it on the app and label it. I like to add in the preferred wind direction for a sit if it isn’t obvious. Sometimes the topography can play with the wind and create “mini-thermals” or bounce the wind around in unpredictable ways that wouldn’t be intuitive by simply looking at the map. This can all be denoted in the waypoint label with detailed information in the note section. One of the great tools with this app that I uncovered after literally stumbling my way to an early-season stand location is the Tracker feature. Stealthy access can be crucial to success, especially when the deer become warier as the season progresses or after rifle season wraps up. The tracker feature on the platform allows you to create a trail from truck to tree to use as a reference later when it’s 5:30 a.m. and you don’t know the trail as well as you thought you did. I’ll admit to having been lost in the pre-dawn darkness a few times. But using the tracker means it won’t happen again — fingers crossed! Sharing is caring! You can now share points (stand sites, access points, trails, etc.) with a buddy. This will come in handy when your out-of-state friend needs a place to hunt. You can share the waypoint of your third-best rut stand. 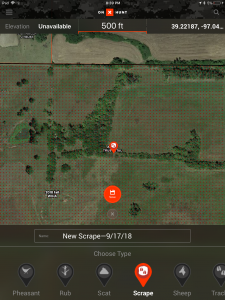 CWD tracking: The Quality Deer Management Association and onX partnered to create a layer that tracks counties with confirmed cases of chronic wasting disease. This lets me know if the disease is prevalent in the area. I can use this information if I need to test a deer. Off-Grid: This feature is probably more useful for the guy getting lost in the Bob Marshall Wilderness Area for a week. It lets you save a map and then go “Off-Grid” so you don’t have to rely on cell service to see your location and load the map. One of my spots has really sparse reception, so it’s nice to use this feature and avoid draining the battery during a sit. Overall, onX has vastly changed how I hunt whitetails. I love the functionality, and it has definitely helped me prepare for a new season. My biggest critique is not so much that it does anything poorly — just that a few more tools could come in handy, especially for the average whitetail hunter. Hunting whitetails is a game of patterns and tendencies. And onX is good, but not yet great, at capturing the information I like to have at my fingertips. I keep a hunting journal and capture as much information as I can about the conditions, sightings, and any other detail I think might help create some luck for me in the future. An integrated calendar allowing for more detailed and accessible data entry would help increase onX’s usefulness in the field. It would be nice to use it as a digital hunting journal, seamlessly incorporate today’s information with last winter’s scouting, or to input trail camera information in an accessible and usable format. All of this information is currently available to be tied to a waypoint. But a more organized and accessible interface would be the cherry on top. I’m a better hunter because of onX. One side effect of using onX in the woods is that I started to actually pay more attention to signs. As hunters, we’re always trying to figure out what a deer’s next move will be. 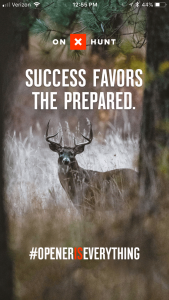 A big part of why I enjoy deer hunting so much comes from the strategy. 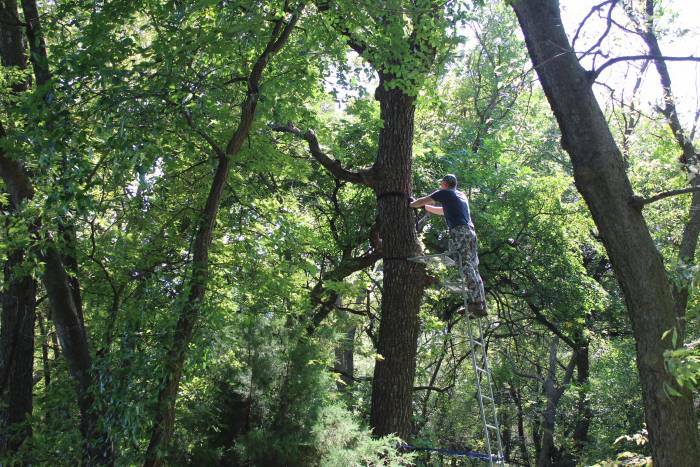 This is involved all the way from selecting a tract of ground to finding the perfect stand location. onX has brought that process into the information age, giving the modern hunter more than enough tools to make crucial decisions. It’s a good thing there isn’t a software program out there that will kill a deer for you. But onX will definitely help you make your own luck. Joel Mason is a professional amateur hunter chasing whitetails and bobwhites in the Flint Hills of Kansas. He likes to fling flies when it’s not hunting season and is a true small game admirer and aficionado. He believes poison ivy exists to discourage morel hunters from finding his secret spots.